It has been a long time since my last recipe post—I’ve been busy eating meat. Well, working on some exciting projects at Foodstand, and eating the occasional portion of meat. But yes, I've reincorporated meat into my diet. I stopped eating the stuff about three and a half years ago. I was never a big steak fan, but I always enjoyed chicken, turkey, pork, and obviously bacon (because bacon is amazingly delicious). But one morning I woke up, and the thought of eating any kind of meat was, let's say, less than appetizing. But this past October I slowly began to reincorporate both poultry and other meat into my diet. Two things triggered the switch. The first was that my doctor instructed me to eat some red meat every week for health reasons, and the second was research I had been conducting for Foodstand's Eat Less Meat Challenge. Yes, seems counterintuitive. Let me explain. On average, we eat a crazy amount of meat. The global livestock industry produces more greenhouse gas emissions than all cars, planes, trains and ships combined. Scary huh! Many Americans can’t even imagine a meal without meat or animal products, which leaves barely any room in one’s diet for fruits, vegetables and whole grains. All of which help lower your risk for heart disease and type 2 diabetes. However, in limited quantities, meat can play a nutritious role in your diet. Think of meat as an accessory on your plate instead of the star of the show, and rely on other protein-rich foods like nuts, beans, plain yogurt and fish to play a larger role. The key is the type of meat you choose, and the frequency with which you eat it. I now eat a small portion of red meat about once per week, and other lean meats such as chicken about 2 times per week. I’m talking meals here, so out of the approximately 21 meals I eat per week, meat is present at about 3 of them. I don’t eat hot dogs or sausage, both of which have been associated with an increased risk of heart disease and stroke. I only eat uncured bacon—and very rarely. And I make sure that my meat is sustainably-raised, local, and organic. I mentioned the environmental impact of the global livestock industry—here’s where it gets interesting. Contrary to popular belief, livestock isn’t inherently bad for the environment, according to my research. Cows that are strictly grass-fed and rotated over different pieces of land are no problem at all. The grass grows where it is eaten, the cows help work the land, and their manure is left to naturally fertilize the soil. The problem arises when cows are grain-fed, and confined to small areas. It takes a lot of water and resources to grow and ship the grain, confinement leads to soil erosion, and the collection of manure into lagoons leads to high levels methane and carbon dioxide. If you want to learn more, I highly recommend reading Defending Beef: The Case for Sustainable Meat Production by Nicolette Hahn Niman. My aunt and uncle suggested I read it (shoutout to the Lindleys!). It's a fascinating read, even if you're not diet geeks like we are. 100% grass-fed cows seem like a no brainer, right? But the livestock industry can’t keep up with our largely meat-based diets by raising cattle sustainably. As a country we eat too much meat—it’s the high demand for meat, and therefore the unsustainable methods by which most meat is raised, that’s problematic. I’ve started eating meat again. But only good meat. Only when I know where it comes from and how it was raised. And I don’t eat too much. Meat is the exception to my mostly plant-based diet. The following recipe was the first red meat I cooked and ate at home a few months ago. The Man was thrilled. 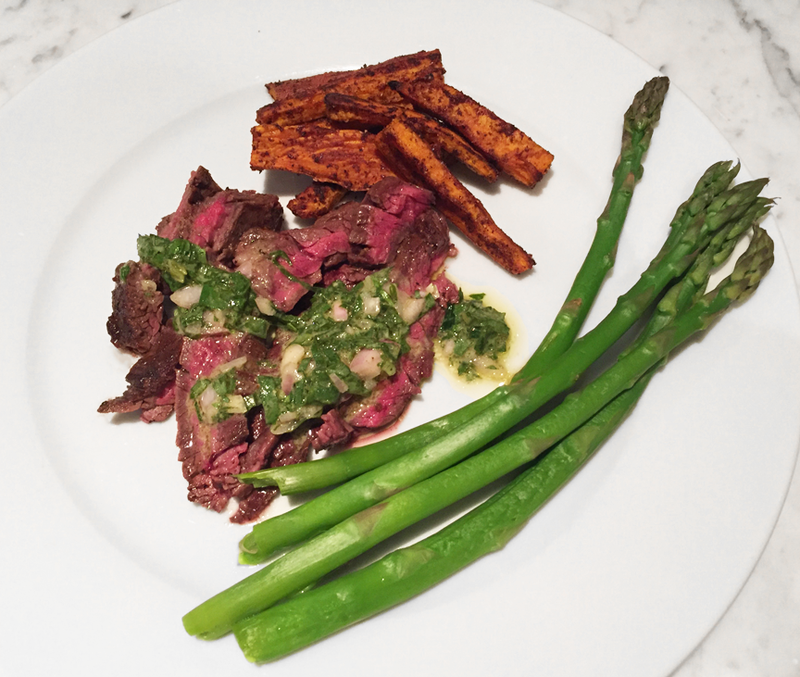 I served it with my Sweet Potato Fries and some simply roasted asparagus. It’s easy, and quite quick—skirt steak tends to be thin and doesn’t require much cooking time, particularly if you like your meat medium rare. Combine all steak ingredients except the steak in a medium container (mixing bowl, Pyrex etc.) and whisk together. Add the steak and toss to coat the steak with the marinade. Cover and refrigerate at least 2 hours (overnight is great too). In the meantime, make your Tarragon Basil Salsa Verde by combining all ingredients except the herbs and whisk with a fork. Add the herbs and toss to combine. Cover and keep in the fridge. Remove the marinated steak and herb salsa from the fridge about 30 minutes before you’re ready to start cooking. Wipe a cast iron pan with olive oil, and set over high heat. Once hot, add the steak to the pan. If the pan is hot enough, you should immediately hear a sizzle. Let the meat cook without disturbing it for about 4 minutes, then flip it over and let the other side cook for 4 additional minutes. Transfer to a cutting board, drape with foil, and let rest 5 minutes. Cut the steak across the grain at a diagonal for nice, thin slices. Arrange on a platter or individual plates and generously drizzle with the herb sauce. Note: My steaks were thick enough such that they were medium/rare after resting. If you have particularly thick steaks, cook an additional minute or two on each side, or if your steaks are quite thin they might only need 2-3 minutes per side. Additionally, be sure not to crowd the steaks in the pan—you don’t want them to steam. Either use two pans, or after half of the meat has cooked, cook the second half. We had just flown in to Connecticut, and were at Whole Foods on our way home from the airport. Since good grocery stores are a hefty distance from our house, it has become a tradition to stop on our way back into town. I love Idaho, but its selection of fresh, organic fruit and vegetables doesn't quite compare to Connecticut, so I was thrilled to reenter the world of organic watermelon and stone fruit, berries that don't cost an arm and a leg, and beautiful lettuces... The list goes on. It was produce heaven. Note: Simply omit the prosciutto for a vegetarian option. It's delicious either way. Whisk together the lime juice, balsamic, Saba, olive oil, cayenne, salt and pepper. Add the arugula and melon to a bowl, and dress with the vinaigrette. Toss to coat. Arrange the mixture on a plate, fold in some prosciutto slices, and garnish with the feta. Often times cooking meat can be easier than preparing all of the vegetarian side dishes—there's a lot of chopping involved! Preparing a meal for the Man and myself that involves an animal protein tends to have far fewer steps than a vegetarian meal. I eat fish but not meat, so regularly our protein is something that swims or grows in the ground. But occasionally I do cook him meat. (Even though I don't eat it anymore, I can still recognize when some chicken or pork would match perfectly with the meal I have in mind.) And when I do cook meat, I'm often appreciative because it usually makes the meal a lot simpler! So here's my go-to quick and easy recipe. You can use boneless or bone-in chicken thighs. Bone-in simply requires slightly more cooking time. Another side note: I used parsley in this one, but feel free to use whatever fresh herb you like. Rosemary works well too. Preheat the oven to 400 degrees. Combine the chicken, garlic, herbs, and a splash of olive oil in a bowl and rub the marinade into the chicken thighs until well coated. Season with sea salt and pepper and toss again. If using boneless meat, roll each piece so that the loose ends are tucked under, and arrange the chicken pieces into a glass or ceramic baking dish in a single layer so that they fit snugly without extra room in the dish. You can cook immediately, or cover and refrigerate overnight as needed, making sure to remove your chicken from the fridge and allow it to sit at room temperature for at least 30 minutes. Roast the chicken for 35-50 minutes depending on the size of your thighs, until the juices run clear (or until your meat's internal temperature reaches 165 degrees). Boneless thighs will take closer to 35 minutes, bone-in thighs will require closer to 50. If you are using skin-on thighs, turn the oven to broil for a couple of minutes at the end to crisp the skin. I was watching the Food Network last night while finishing up work and starting to cook dinner, and all I can say is CHOCOLATE! Three hours of cooking show background noise later, and every single recipe was based on chocolate. So clearly the internet is flooding with what to cook for dessert on Valentine's Day (also known as Saturday, if you prefer not to dedicate a day to the patron saint of love). But what's for dinner? A perfect roast chicken. Regardless of how you view February 14th or who you treat to a home-cooked meal, making something simple yet impressive is always a good call. And carving up a golden juicy chicken on a brightly colored bed of roasted fruits and vegetables will do just the trick. I created this recipe last summer when figs were in season. While figs aren't in the trees or the grocery stores this time of year, apples and pears are, and either would roast perfectly alongside chicken, vegetables, and rosemary. Regardless of which fruit you chose, this one-pan-er would be a great precursor to the chocolate extravaganza that's likely to follow. Everyone has their favorite recipe for a classic roast chicken. How to get the juiciest meat, crispiest skin, and most flavor are points argued all over the world by professional chefs and at-home cooks alike. I add a twist and throw some classic vegetables and fruit into my roasting pan. This way, when you remove the chicken, vegetables and fruit before deglazing the pan, it's not only chicken bits that are left behind to infuse the drippings. The sweetness of the figs (or apples or pears) and flavor of the vegetables are incorporated as well. Truth be told, unfortunately the Man and I will not be cozying up to a warm, home-cooked meal on Saturday night, but instead will be nibbling on airplane peanuts somewhere in the sky between Idaho and Connecticut. Send me your roast chicken photos so I can live vicariously through you and your delicious dinners! Preheat the oven to 450 degrees. Oil the bottom of a roasting pan, and set aside. Meanwhile, rinse and thoroughly dry the chicken. Rub it with olive oil, and season inside and out with salt and pepper. Stuff the cavity with the lemon quarters, celery, parsley, 3 sprigs of thyme, 3 sprigs of rosemary, and the smashed garlic cloves. Tie the legs together with kitchen string, and place the chicken breast-side up in the pan. Combine the remaining lemon slices, rosemary, thyme, and garlic halves in a bowl with the onion, leek, vegetables and fruit, and toss with additional olive oil. Season with salt and pepper, and spread the vegetable mixture around the chicken in the pan. Place the pan in the oven and cook for 25 minutes, then lower the heat to 400 degrees for approximately 1 hour until the internal temperature of the chicken reads 165 degrees and the juices run clear. Remove the chicken and vegetables to a serving platter, tent with foil, and let the chicken rest about 20 minutes before carving. Meanwhile, place the roasting pan on a burner and carefully pour in the white wine. Turn the heat to low and deglaze the pan by scraping the bottom with a wooden spatula to infuse the drippings into the wine. Once the desired consistency is achieved, pour the sauce into a vessel to serve alongside the chicken.